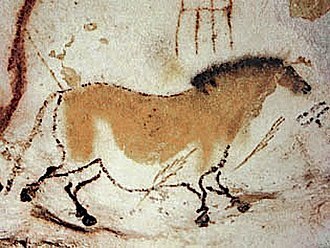 Ojala, Jeanne A. (1987). "Suchet: The Peninsular Marshal". In Chandler, David G. Napoleon's Marshals. New York, N.Y.: Macmillan. ISBN 0-02-905930-5. 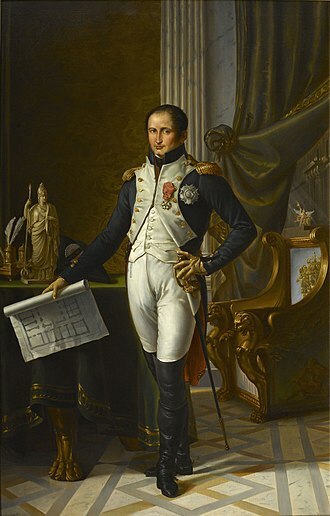 Marshal of the Empire was a civil dignity during the First French Empire. It was created by Sénatus-consulte on 18 May 1804 and to a large extent resurrected the formerly abolished title of Marshal of France. According to the Sénatus-consulte, a Marshal was an officer of the Empire, entitled to a high-standing position at the Court. Although not a rank, a Marshal displayed four silver stars, while the top military rank, General of Division. Furthermore, the Marshalate quickly became the sign of the supreme military attainment. Each Marshal held his own coat of arms, was entitled to special honours and they wore distinctive uniforms and were entitled to carry a cylinder-shaped baton, which was a symbol of their authority. 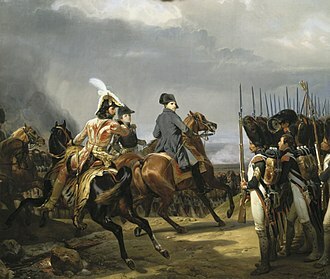 Throughout his 1804–1815 reign, Napoleon appointed a total of 26 Marshals, the initial list of 1804 included 14 names of active generals and four names of retired generals, who were given the honorary title of Marshal. Six other promotions ensued, with eight other generals elevated to the Marshalate, the title often ensured a highly privileged social status – four Marshals were created Counts of the Empire and 17 received either the title of Duke or Prince. With two exceptions – Jean-Baptiste Bessières and Jean-Mathieu-Philibert Sérurier – the Marshals led a lifestyle and left behind significant, at times immense. Two Marshals – Joachim Murat and Jean-Baptiste Bernadotte – went on to become Kings, a single commander, Louis-Vincent-Joseph Le Blond de Saint-Hilaire, was publicly named as a Marshal-to-be by Napoleon, but he died of battle wounds before the next promotions were made. 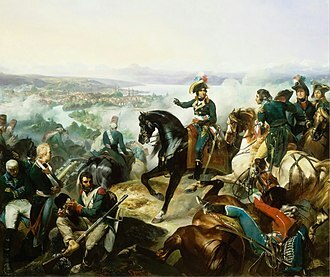 Most of the Marshals held significant commands during the Napoleonic Wars, three of them – Jean Lannes, Louis-Nicolas Davout and Louis-Gabriel Suchet were virtually never defeated in pitched battle, despite fighting in dozens of engagements. 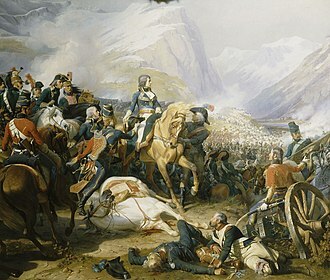 Often formidable when serving under the command of Napoleon, the Marshals proved to be less effective when having to cooperate. Some repeatedly acted in ill-faith when placed under the command of another Marshal, after Napoleons downfall, most of them swore allegiance to the Bourbon Restoration and several went on to hold significant commands and positions. 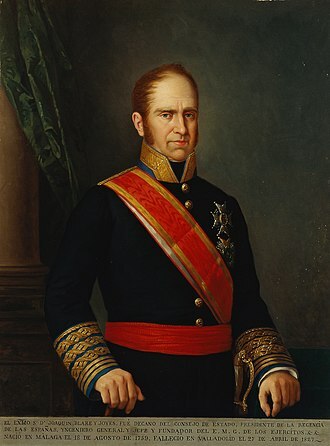 In the Siege of Tarragona from 5 May to 29 June 1811, Louis Gabriel Suchets French Army of Aragon laid siege to a Spanish garrison led by Lieutenant General Juan Senen de Contreras. A British naval squadron commanded by Admiral Edward Codrington harassed the French besiegers with cannon fire, Suchets troops stormed into the defenses and killed or captured almost all the defenders. 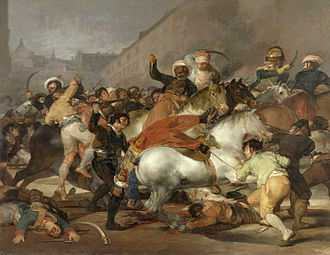 The action took place at the port of Tarragona on the east coast of Spain during the Peninsular War, emperor Napoleon offered Suchet a marshals baton if he could capture Tarragona, so the French general pursued his goal vigorously. He methodically overran the outer works as he drove his siege parallels forward. 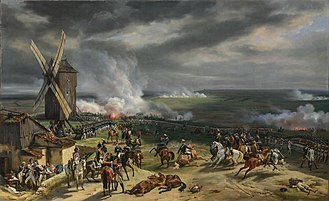 The French general easily fended off weak attempts to relieve the city by land, near the end of the siege, the French troops captured the lower city in a surprise attack and the garrisons survivors retreated to the upper city. 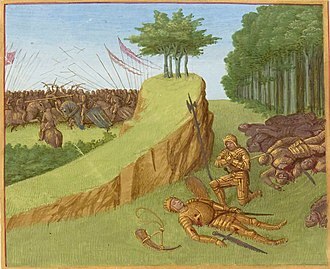 At the end, Suchets men stormed into the city amid scenes of horrific slaughter. The loss of this base and so many Spanish troops crippled the Army of Catalonia. Sagunto is a town in Eastern Spain, in the modern fertile comarca of Camp de Morvedre in the province of Valencia. It is located c.30 km north of Valencia, close to the Costa del Azahar on the Mediterranean Sea. It is best known for the remains of the ancient Iberian and Roman city of Saguntum, the city traded with Greek and Phoenician coastal colonies, and under their influence, minted its own coins. 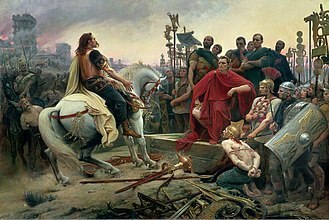 During this period the city was known as Arse, after stiff resistance over the course of eight months, related by the Roman historian Livy and in more detail by Silius Italicus, Saguntum was captured in 219 BC by the armies of Hannibal. Seven years the town was retaken by the Romans, in 214 BC, it became a municipium, was rebuilt and flourished. Hispania was not easily pacified and Romanised, as the Iberian career of Quintus Sertorius makes clear, Saguntum minted coins under his protection, but continued to house a mint in Roman times. 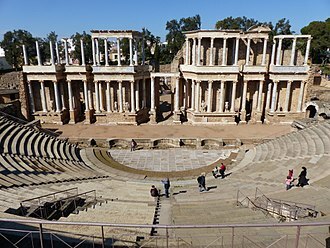 The Romans built a circus in the lower part of the city. Texts found indicate that the city had an amphitheatre and had about 50,000 inhabitants and this prosperity lasted for most of the empire, and is attested by inscriptions and ruins. Under the Arian Visigothic kings, Saguntum received its Catholic patron saint, a bishop named Sacerdos, the priest, the town was known as Morvedre, a name derived from Latin muri veteres ancient walls. However, as Valencia grew, Saguntum declined, in 1098, the city was conquered by El Cid but the Muslims recovered it shortly thereafter. The city had been under the Muslim Arab rule for five hundred years when James I of Aragon conquered it in 1238. During the Peninsular War a Spanish attempt to raise the French siege of the castle failed in the Battle of Saguntum on 25 October 1811, Saguntum was badly damaged in warfare, but has retained many Valencian Gothic structures. In the late 19th century a steel-making industry grew up that supported the modern city, the last steel oven closed in April 1984. It has been restored and is now a tourist attraction, the remains of Sagunto Castle may be seen on top of the hill. It preserves much of its ramparts, of Roman and Moorish origin. A Roman theater, partly restored in late 20th century and it is found on the northern slope of the citadel hill.